Want to find out more about Arkansas Acroyoga that isn't included on our website? Give us a shout by phone, email, or message on Facebook! Come join us for class each week at Sonshine Academy! We have great news! We were able to reserve the gymnastics gym at Sonshine Academy for our afternoon workshops on Sunday, festival weekend! We taught classes at this wonderful space for years and are so excited to get to go back for the day. Because the spring floors and mats provide a safer environment, we shifted our schedule around to get the right workshops in this space. ALSO, only 6 days left to SAVE 20% on your ticket! Early Bird pricing ends Saturday, April 20. You can follow the link in our instagram bio to view the schedule and purchase your ticket. Instructor Spotlight! • • Aaron Lind has offered uplifting, educational, and empowering acro experiences consistently for over 11 years across North America, Mexico, Canada, Europe, and Asia. He has not taught on Antarctica (yet!). He offers classes, workshops, weekend intensives, training retreats, a 90 hour immersion system, and a 200 hour teaching mentorship course for those interested in leading acrobatics classes. Aaron’s teaching philosophy is that through progressive training and attention to detail at a fundamental level, challenging skills become accessible, aesthetic, efficient, safer, and more fun! Workshops Aaron will be teaching include: • Dynamic Counterbalances & Popping Through H2H and F2H • You can also catch Aaron during his day-long Icarian intensive post-AAY Fest the following Monday, May 13th. For more info on his workshops and intensive, check out the AAY Festival Page link in our bio! We have a festival schedule for you all! 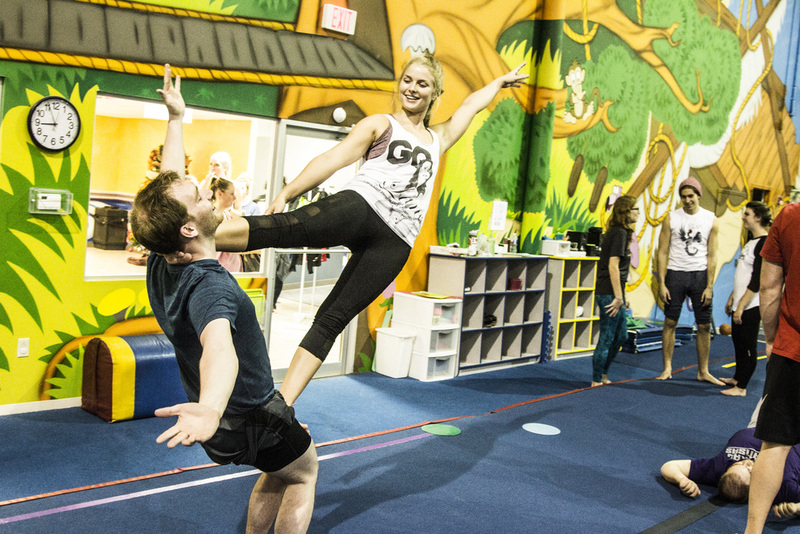 We’ve got a bunch of fun workshops planned for people of all levels, whether you have never tried acro before or are looking to level up. Check out our facebook page or our insta bio for a link to more information. For today’s #membermonday post, we want to highlight @alexemmerich . She is a fearless flyer, supportive spotter and a budding base. She loves trying new skills and is one of the first to play during jams. But what we love most about her is her kind and loving heart and her cheery attitude. She never fails to light up the room. Thanks for being a part of our community, Alex! Instructor spotlight for our first ever Arkansas Acro yoga festival! Amy Hardy has been doing acro since 2015. She registered for a pops workshop as a birthday present for herself, and was instantly hooked. She performs in the Tulsa area regurlarly with Flying Lotus Acrobatics. She's an acro hybrid, she loves flying, basing, and every level of trio poses and flows. She recently completed Acro Mastermind Teacher Training with Chelsea and Jason Magness in New Zealand in January of 2019. Come see @acroyogininjawitch at the festival May 10th-12th! Hey you! Guess what? We have an Early Bird special for you! Before 4/20/19, you can save 20% on your Arkansas Acro Festival ticket. We have an awesome lineup of instructors from Arkansas and from out of state. You won’t want to miss it. We also have a pre-order special on tshirts (ending 3/15) Visit our website www.arkansasacro.com to get your tickets or to pre-order a shirt. Member Monday! We would like to introduce to you an amazing addition to our student community. Macy started training with us after she moved here from Birmingham. She has a tough girl vibe with the sweetest heart. Having her as a skilled flyer and brave lady base in class has made us so proud! Keep doing your thing, girl. We love you! Instructor spotlight for our first Arkansas Acro Yoga festival! Tami Coulson is a former competitive gymnast and coach from Tulsa, OK. She is certified through Acro Revolution and has been teaching partner acrobatics for over 5 years. She has been featured at Acro Share, AcrOhio, Big Om, I AM festival, and many others. She also performs locally and won the 2017 Tulsa has Talent competition. She teaches all ages, small children to adults and her passion for acro truely shows in her classes. Come see @acroloveyogi May 10th through the 12th at AAY Festival! This Member Monday, we want to shout out @jasonkneadsyou . He’s been a part of our community for about six months now and we love having him around! He is an incredible base, a daring flyer and quick learner. He is so good about helping people feel included. He is a feeler, a healer and an emotional support to those in need. Thanks for being you, Jason! Instructor Spotlight for our first Arkansas Acro Yoga festival! (May 10th-12th) @brittatron is a teacher of Vinyasa Yoga and a lover of expression through movement. Her style is upbeat and fun with a down to earth feel. She is well rounded in training of yoga, acroyoga, sports movement, dance, and meditation. Expect to find a centered yet free approach to your yoga practice through her classes. The message behind every class is “You are loved, all is well.” She was an Arkansas AcroYoga instructor for about a year and is very near and dear to our hearts. She now lives in North West Arkansas where she teaches yoga and supports the acro community. She will be teaching “From the Ground to the Air,” an introductory level workshop that creates connections between yoga and acroyoga poses.